Stephen was born in St. John’s, NL in 1943. Stephen first took up carving while stationed in Germany with the Canadian army in the early 1960's. After leaving the army he worked as a carpenter, labourer and a mall superintendent. His early work was primarily devoted to relief carvings of local subjects and life size people. More recently his work has turned to colourful birds and black and white fish. 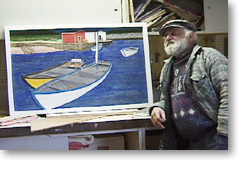 His work is included in many private and public collections. Ref: Nova Scotia Folk Art Festival Society, A Joyous Vision - Contemporary Folk Art in Nova Scotia (1995); Blake McKendry, An Illustrated Companion to Canadian Folk Art (1999).